Got A Few Sleepyheads Requiring Beds? Our Large Cabins Have Tons of Space! From $78.00 Per Night. Aaron Lodge TOP 10 Holiday Park offers modern facilities and amenities to ensure the entire family has a comfortable and fun packed holiday. Aaron Lodge TOP 10 Holiday Park is the perfect base for your Dunedin adventure. Explore the natural beauty and exciting activities of the region. Just 2.5km from Dunedin you can enjoy the best of both worlds - city culture and wild nature. Click here to view directions to Aaron Lodge TOP 10. Capture the best of both worlds at Aaron Lodge TOP 10 Holiday Park, as you find yourself in the heart of Dunedin's Kaikorai Valley, with the bustling Scottish settlement of Dunedin on one side and open native bush on the other. Our location is a peaceful escape, set amidst sprawling park like grounds with easy access to everything Dunedin has to offer. Just 2.5km from Central Dunedin you can enjoy the best of both worlds - city, culture and wild nature. Aaron Lodge offers the complete package with everything you could possibly ask for during your New Zealand holiday. Every need has been considered to provide you with comfort, convenience and great entertainment. The whole family will feel at home at Aaron Lodge! Take advantage of the heated swimming pool and spa pool to relax and unwind. Pass the time one sunny afternoon and play a game of pétanque or a round of mini ‘Park Golf’. Stay in touch and share your exciting holiday stories with WiFi access and computers on hand. Let the kids have fun in the playgrounds whilst you watch from beside the BBQ. All these facilities and more make Aaron Lodge your TOP choice for premium family Dunedin accommodation. Choose from a range of quality accommodation types to suit any budget, whether you are out on the road enjoying adventures in campers and tents or looking for a little comfort and luxury, such as our three plus star motel units. 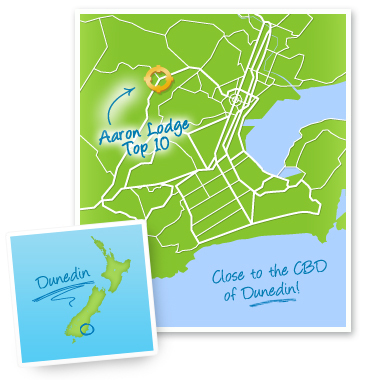 Aaron Lodge TOP 10 Holiday Park has the ideal accommodation option for your next Dunedin holiday. Dunedin offers a host of activities and attractions to suit everyone in the family. While in Dunedin you can get up close to nature and visit the nesting grounds of the delightful Yellow Eyed Penguins or the Albatross Colony. Take a tour of The Cadbury Chocolate Factory (exciting for all ages), visit the City Art Gallery, Taieri Gorge and Seasider Railway. For a more relaxing pace you can simply wander around the cafes and shops of the Octagon or stroll the pristine white sands of St Clair’s surf beach. There is much to see and do while in Dunedin and no better place to stay than the quiet garden grounds of the Aaron Lodge TOP 10 Holiday Park, located just 2.5km from the city centre.